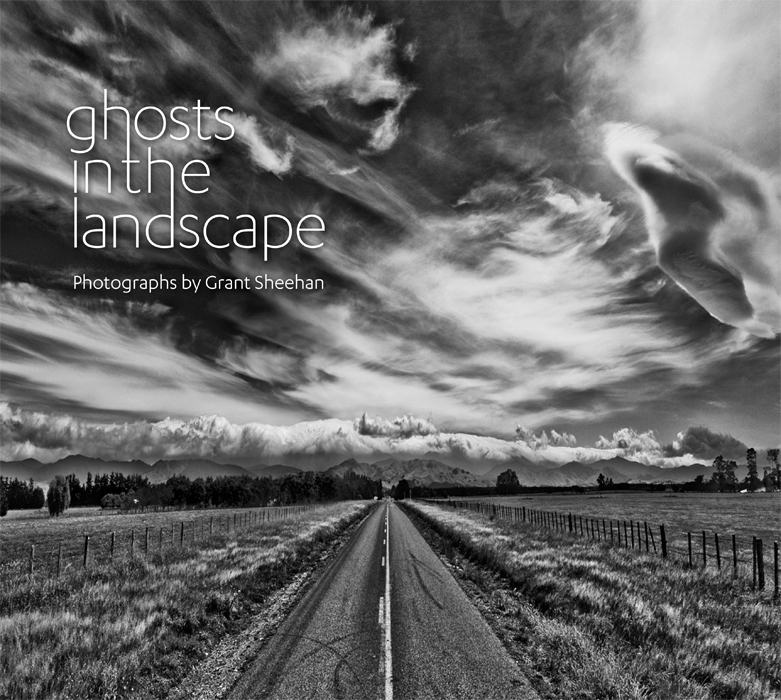 A book collection of big photographs produced in a limited edition of 1050 copies, Ghosts in the Landscape by Grant Sheehan embodies the contradictions that define contemporary photographic practices. Capturing sweeping vistas on a 22 megapixel camera and processing them in a ‘digital darkroom’ using software plug-in Nik Silver Efex Pro 2, the photographer is able to generate carefully reworked images that accurately recreate the historic visual characteristics of black-and-white film. In the year 2012 though, a book of this nature does prompt the reader to ask why Sheehan has chosen to use film in what is a predominately digital age. Aren’t we saturated in digital images to the extent that these once precious rectangle fragments of our past inspire little more than brief moments of longing punctuated by a swift return to relative disinterest? Given this default condition, it may well be that Sheehan is attempting to infuse our collective memory with the ‘sacredness’ that it was once afforded — that is, the sacramental notion of the singular. The production of Ghosts in the Landscape certainly echoes this sentiment in utilising pearlescent coated paper and metallic silver toned ink, which have been combined with an up-to-the-minute printing technology that the publisher asserts ‘give the images the same clarity and sharpness as an exhibition fine-art print’. The notion of the limited edition and fine art print is traditionally related to the notion of authenticity — the notion of the ‘one off’ unique artwork. It is this pictorialist strategy that the artist, seeking to capture the aura of the places/spaces he revisits, refers to when he speaks to the reader of the ‘quintessential’, the ‘classic’ and the ‘old, as in: old farmhouse, old corrugated barn, old fame shed, old abandoned house, old railway’s windmill, old launches, old pier, old Denniston Coal Mine, old sulphur mine, old gun emplacement. A photographer’s impulse to revisit and revive the significance of the past is established through references to ‘the trace’ or — as here — to ‘ghosts’. And that desire to represent the lost or forgotten, to valorise them, is expressed by Sheehan in iconic images of the New Zealand landscape which frequently reflect the familiar. But if constructed collections of images have the ability to evoke collective memory, then can this be authentic when altered or reinterpreted? The intentions of Sheehan’s photographs operate within this speculative territory (the sheer multiplicity of images about ‘landscape’), which many other photographers are also currently addressing — or questioning. As one theorist has put it: ‘In other words, the masses will not think about the memories of the past, but they will watch the presented images each time they are required to remember.’ So Ghosts in the Landscape may function in this way — that is, representing the artist’s own nostalgic desire to reconstruct memory. However, one questions whether such endeavours do encourage a viewer’s memory to become activated in response, or whether in point of fact we are being provided with the elaborate creation of a period-era fiction to ‘represent’ the actuality of place. Sheehan’s comment in his Introduction to a ‘visual journey through New Zealand and Antartica’ refers to signifiers of the past and in particular to his childhood vision of the world as interpreted through black-and-white 1960s television imagery and photographic and film imagery of 1950s New Zealand. Photography’s presumed association with evidentiary proceedings, or with a perceived ‘truth’ (the documentary aspect), is in this sense inherently undermined, for, although it is generally accepted that photography represents the subject before the camera, it is impossible to separate the hand, or more importantly the eye, of the photographer from the image produced. Photography has since its inception been subject to manipulation, but it seems that our mistrust of the photographic image has increased significantly. Is photography still something we care about as a medium that preserves our culture and identity, or has its level of accessibility destroyed photography’s aura, leaving behind the mere ‘meme’ of what it once was. Has our romance with nostalgia become so jaded that we crave immediacy and what’s disposable in the place of history and slow-time authenticity? While human presence is suggested throughout Sheehan’s journeys, his spaces and places speak primarily of abandonment and the discarded; perhaps it is therefore Sheehan’s intention to portray collective memory – to offer signifiers of history and identity as largely ghosts of what they once were. A number of the images are accompanied by small references to both public histories and private memories. These are scattered throughout the book with no particular evidence of synchronicity. The subject matter performs overall as a kind of memorial to the dead and dying, evoking remnants of a decaying human existence which, over time, gradually fade from consciousness. It could be argued, as this book does through its images, that the search for a static identity which can be pinned down or relied upon as fact functions to satisfy our craving for a sense of belonging or connectedness. And the acceleration of technological advantages serves, paradoxically, to increase our craving for presumed stability and the assertion of a defined national identity. If one considers Sheehan’s work as evoking national identity, then New Zealanders are in love with wide open spaces, forests, waterways and mountain tops, while also being content with relative isolation — though not without a concomitant commitment to memories (and memorials) of past losses. accessibility, into the position of being somehow limited or exclusive. Fidanoglu, Dr Esra: ‘To Embody Home; Constructing Space in the Cracks of Ruins.’ In Sites of Recovery; Architecture’s (Inter)disciplinary Role. Conference proceedings of the 3rdinternational ‘Other Connections Conference’, University of Melbourne, June 1997, p.127. Sontag, Susan: On Photography. Picador: Farrar, Straus & Giroux, New York, 1977 p.65. KATHRYN MITCHELL is an art writer and a former public gallery curator, who is currently the art programme manager at the Southern Institute of Technology in Invercargill.